MiniKingdom: Flames of War, Open Fire painting progress. Flames of War, Open Fire painting progress. Plenty of models to paint in this boxed set. Once all constructed I set about painted the German forces first, these were the paints I had easily at hand at and a colour scheme I have already been painting in current months. This was also the majority of models to be painted and a good chunk to finish first. I have quickly discovered that painting these infantry in their full detail is comparable to painting a force of this many individuals in any scale. That is 85 models in this case. These plastics are very well detailed and contain far more accuracy and attention to details than many other larger scaled kits. My first concern was whether to affix all models to the bases or not. 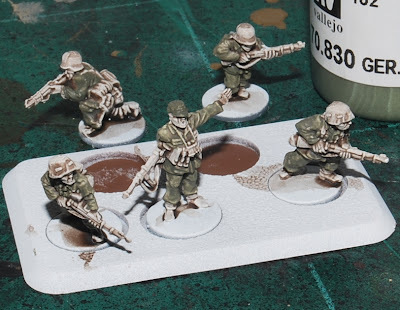 I had seen all infantry affixed in a line to something else to ease painting. I decided to glue most of the models to the bases and only keep key models separate, those which severely hampered access to the other models on the base. This made handling and storing the models easily without much risk of losing individual men. QUICK TIP: To affix the separate models to the bases temporarily I used Pritt Stick, simply applied to the bottom of the round base. This was secure enough for handling the infantry base and for most paint application. Even when dried the model can be easily lifted off. When ready, scrap of any excess and the model will stick done correctly with plastic glue as always. Uniforms under way, two models not glued permanently. Note, before starting any base colours I inked all models over a white undercoat, Devlan Mud naturally. This not only helped emphasize all details on the flat white model (I can not imagine trying to see these details on black) it also creates a subtle natural shadow for each colour applied afterwards. Now with the base colours, listed below for comparison or anyone's interest. Camo patterns, mettalics and highlighting yet to come. Vallejo - German Fieldgrey : Uniform. Foundry - Buff Leather Shade: Camo smocks/helmet covers, panzerfaust/schrecks. Foundry - Deep Brown Leather Shade: Webbing, weapon straps, pouches, holsters, boots . Foundry - Butter Fudge: Skin. Vallejo - German Camo, Drak Green: Helmets, gasmask canister. Vallejo - Flat Earth: Flask cover. Vallejo - German Camo, Beige: Bread bag, ankle wraps. Foundry - Bay Brown: (All wood) Weapon stocks, trenching tool/stick grenade handles. Vallejo - Black Grey: (All metals & misc) Rifles barrels, pistols, machine guns, grenades, spade, flask top, ammo boxes, Officers jack boots, binoculars, radio. Interesting technique of starting with the inked white. The Stugs' tracks/sides look a little....wonky? Malifaux Commission, Lady J & the Marshals. Flames of War, Open Fire, Sherman fixes.